While hunting deep in the woods two boys discover a hidden World War II military bunker and unknowingly resurrect an undead soldier. Believing the Nazi’s have landed the zombie soldier defends his homeland embarking on a killing spree thinking he’s protecting against a Nazi invasion. A police investigation into the brutal murders leads them to former auxiliary soldier Jack (John Rhys-Davies) who helps them uncover Britain’s most deadly secret. Poorly written dialogue from the father and son collaboration of Peter and John Adams delivers the most unrealistic performances that I just can’t blame on these actors. John Rhys-Davies is a well versed thespian who somehow rises above the script creating a heartfelt character that somehow stands out from the rest even from his bed. With every performance consistently surreal it lends to the quality of direction from son John Adams who helms his first feature. Nonsensical reactions to what’s happening on screen from the kills to the conversations fails to mimic real life even if it were a given there’s a Nazi killing zombie soldier on the loose. 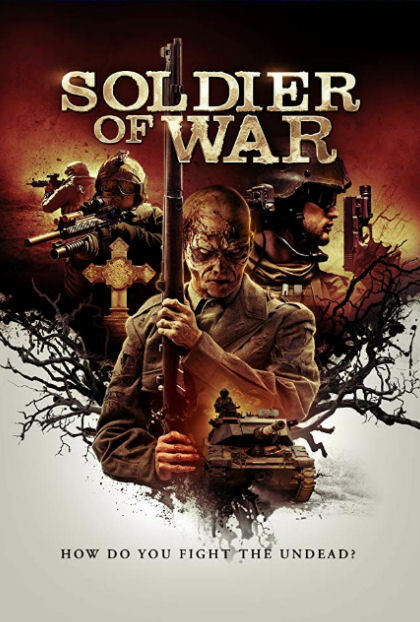 Technically sound production values creates an Aux Soldier of War who’s an interesting retro killer with some fun slasher kills. Sadly the kills are mostly tainted for me by using CGI instead of going practical. The killer looks good which is surprising as that’s where most wannabe slasher films fail at by trying too hard to be original or memorable. Scenes like the traditional slashing of a couple making out in a car are ruined by the obvious adding in of the car crashing into a tree which doesn’t fit the rest of the scene at all and the addition of CGI blood which always looks ridiculous. The British and American covers are horror movie cool but also both misleading. This is mostly a very simplistic investigation movie with random slashings. Aux or Soldier of War has the potential to go down as a modern day version of the cult favorite 1981 mess of a movie The Prowler. For a retro horror critic such as myself, modern day killings that made The Prowler so fun and saved the atrocious continuity and logic of the script just can’t do the same when using CGI enhancements that take all the fun away.